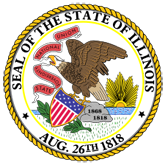 It is illegal to operate a vehicle in Illinois with a blood-alcohol concentration (BAC) of .08 percent or greater. 1. DUI -- Contributing to DUI (20060724220008_dsd_a1494.pdf).